On Friday 8th March 2013 we held a session on how tenants can get involved in dealing with complaints as regards housing services under opportunities introduced by the Localism Act. 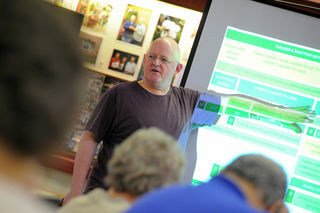 The event was led by Nic Bliss from a National Tenants Organisation. (See picture). The event was well attended - we had tenants from 3 Housing Associations and Council tenants whose homes are managed by 3 managing agents plus we had officers from the Council, from 2 of the managing agents and one from a Housing Association. We are now looking at how we can take this forward and will keep you posted.